And thanks to Alfie, Snoopy, Luna and My Brown Newfies for bringing us the Monday Mischief Pet Blog Hop. 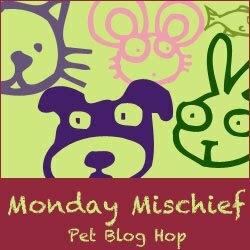 Make sure you hop on through to the other blogs and see what trouble our various critters can get into over the weekend. That class does sound like a lot of fun. I can just imagine her running the A Frame! Hooray for Bella! Sounds like a great class and she has some sweet classmates :) Can't wait to hear more about the other obstacles!! This made me smile. I think Bella is loving agility. Reading her last few sentences made me smile because it reminded how Jasper is now when we go to sheep herding lessons. He knows right away now and will start barking and whining before we pull in the driveway. Mom says I would have done well with agility but at 6 it is a bit late to start. My sister tried it as a puppy and got kicked out or being a nuisance...behaving is not her thing...I think you will have tons of fun! If mom was looking to build Lily's confidence but she's too scared to 'go to school', I can give you some ideas about how to build your own agility obstacles... Let me know if you're interested. This is a wonderful interview. I'm glad Bella is doing so well in her agility class. Delilah loves her classes too, I think that is something you accept with these super smart dogs, that you need to find ways to engage their brains and keep them busy. Once you do that, you see a huge difference in the dog. Yay! I loved Bella's perspective and I am so glad she seems to be enjoying herself out there. I have seen agility classes help many of my real-life friends and even though some of them will never be fully comfortable in close proximity to other dogs they have come a long way and are only getting better. It's fantastic Bella is growing so much and in such a short time. Sounds like you had an awesome time in class, Bella! Keep up the good work! What a great interview Bella! It took us a month just to get Honey to walk on a flat ramp. I don't know what it would take to get her to walk over an A-frame. Goes to show every dog has her inner scairdy-pup. Loved hearing more about your class. It's great seeing Bella thrive. Thanks, Pamela. If it's any consolation, it took 6 months to get her over the dog-walk successfully - the width of the ramp seems to play a significant part in the confidence department. Oh Roo, you would have so much fun in an agility class! You'd be very good at it, too. I swear there is something about fearful dogs that just draws people to them. EVERYone wants to touch Bella - it's like a personal challenge or something. Poor Meadow - Bella feels for her. I love this interview. It's fun to try to figure out what our dogs are thinking. It sounds like you know Bella very well. What a great class!!!! It's so good when trainers go to the effort to put together a class like yours for "special" dogs. I too wonder what makes some reactive dogs behave aggressively toward scary things and what makes others collapse (Shyla is in the collapsing category). In some ways, it feels easier to have a "collapser" because I'm not afraid of her harming someone but I feel so badly for her when she enters that non-thinking terrified state. Thanks for your insight on setbacks and how they change with time. Shyla definitely had a huge setback after being spayed... but, as of this week, she seems to be bouncing back! She still gets scared of lots and lots of things but they don't paralyze her like they did last week. Bella- You do indeed rock. The A-Frame is a pretty big deal. My non-scardey dogs won't go over one.